Add wine and simmer slowly until the wine is almost all reduced. Beat cream into egg yolks; add lobster and season. Cook stirring constantly until thickened. 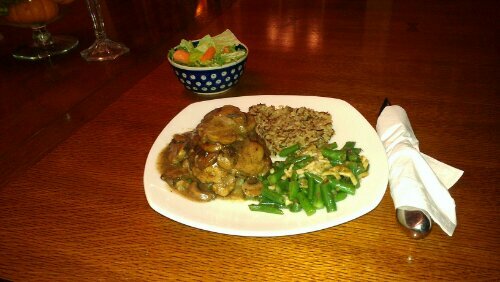 I’m serving over Jasmine rice, baby lima beans and a green salad. As always, pair with your favorite wine. 2 dashes ground clovesCombine orange juice, soy sauce, sherry, garlic and cloves. Place steak in plastic bag; add marinade, turning to coat. Tie bag securely and marinate in refrigerator 2 to 4 hours, turning at least once. Drain marinade from steak. Place steak on rack in broiler pan so surface of meat is 3 to 4 inches from heat. Broil 8 to 9 minutes, turn and broil second side of steak 8 to 9 minutes to desired doneness (rare or medium). Carve into thin slices. 4 servings.Tonight I’m serving the grilled steak with roasted potatoes and green beans and onions with a little bacon and a fresh green garden salad. Preparation: With sharp knife, slice each shrimp in half along back, leaving tail intact. I am going to dust lightly with some flour and old bay seasoning. In large skillet, heat butter and oil over medium heat, until butter is melted. Add shrimp; cook, stirring, until pink and tender, about 3 minutes. With slotted spoon, remove to bowl, set aside. Add garlic to skillet; cook, stirring, 1 minute. Add wine, lemon peel and juice, cilantro and capers, salt and pepper and bring to a boil. Return shrimp to skillet, coating well with wine mixture; heat through. I’m serving over a bed of noodles a side of fresh green salad and green beans wrapped in bacon. Preheat the oven per turkey package. Combine the butter, lemon zest, thyme and garlic in a bowl. Place the turkey breast inside a large roasting pan. Spread all over the turkey and on both sides and under the skin with the lemon and thyme butter. Pour the lemon juice and olive oil over the turkey, season with salt and pepper and Roast turkey according to package directions. Remove the foil and roast, basting with the basting sauce every 10 minutes for last 60 minutes or until the skin is golden and the juices run clear when tested with a skewer. 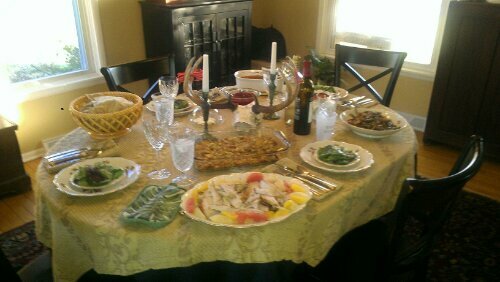 Reserve the pan juices and allow the turkey to rest for 10-15 minutes before carving. Prepare the orange and grapefruit segments: Segment the oranges and the grapefruit over the same bowl, ensuring that you capture all of the juices. Melt the sugar in a saucepan over a low heat, do not stir and stay close by to make sure it does not burn. Remove from the heat once the sugar starts to turn golden brown. Layout a sheet of tinfoil on a baking sheet and lightly coat with oil. Sprinkle the pistachios over the foil and drizzle the warm syrup over. Allow to cool and harden. Once set, remove the praline from the foil and break into shards. Serve the carved turkey warm, with orange and grapefruit segments and pistachio praline. Drizzle with a little of the remaining pan juices and some of the orange and grapefruit juice if desired. Notes: Try to make your praline as thin as possible so that it will melt easily when served alongside the warm turkey. Warm the tortillas according to package directions. 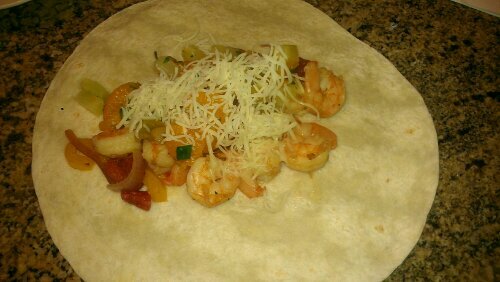 Spoon 1/8 of shrimp mixture onto a tortilla; top with a portion of salsa and cheese. Fold in the edges and roll up tortilla. Repeat with remaining tortillas. Serve immediately. Saute sausage in medium skillet until well browned on all sides. Remove from pan; slice into thin pieces. Return to pan and add onion and garlic; saute until onion is tender, but not brown. Cook small Rigatoni according to package directions for 10 minutes; drain. Combine Rigatoni, sausage mixture and Ricotta; mix well. Pour 1/2 cup sauce on bottom of 3 quart casserole. Spread 1/3 of Rigatoni and sausage mixture over sauce; cover with 1 cup sauce. Sprinkle 3/4 cup Mozzarella and 1 tablespoon Parmesan over sauce. Repeat layers of Rigatoni and sausage mixture, sauce, Mozzarella and Parmesan twice, ending with Parmesan. Cover; bake at 400 degrees for 20 to 30 minutes or until hot and bubbly. 4 to 6 servings. 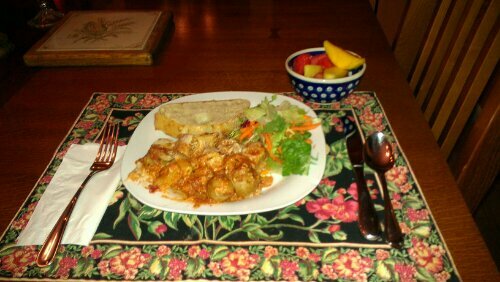 Tonight serving with garlic bread, green salad and fresh fruite compote.